The green states have mandatory renewable portfolio standards which means that, by a certain year, a percentage of electric generation must come from non-fossil sources. But what’s interesting is the white states. 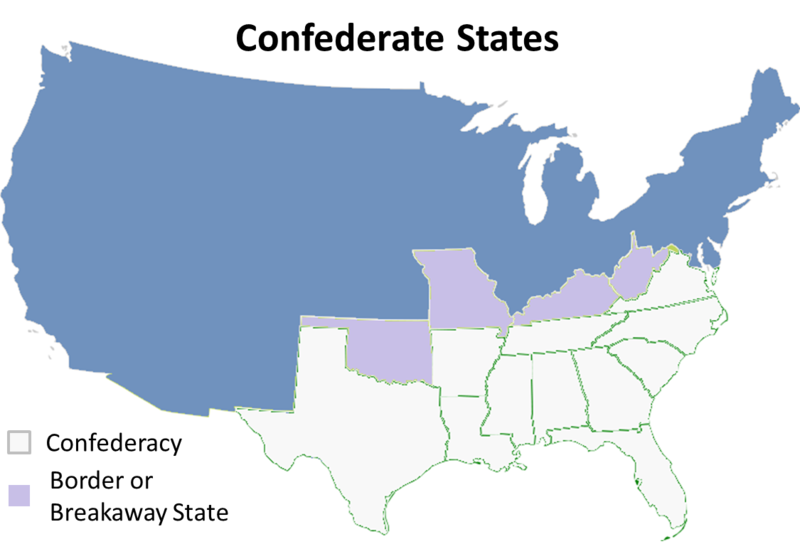 With the exceptions of Texas, North Carolina, and Missouri, which have RPS goals, you can see the outline of the Confederacy. The alignment isn’t perfect. Texas has massive wind power and high tech, so it has an economic motivation to have RPS goals; NC is a rapidly urbanizing, high tech “purple” state. Missouri is an outlier, although its legislature has tried several times to repeal its RPS goals since the financial crisis of 2008. West Virginia split from Virginia over the issue of slavery when the Civil War broke out, but it retains a sympathy with its neighbor reflected in its name—and its economy is based on coal. Oklahoma wasn’t a state in 1861, but was settled largely by Southerners during the land rush preceding statehood in 1907. This overlay isn’t a coincidence. The Tea Party is just the latest manifestation of a mentality bred in the South and rural areas with Southern affinities that pre-dates the Revolutionary War. In fact, that mentality was the Civil War’s seedbed and kept segregation alive for 100 years. We can see it in the disdain many Tea Partiers have for “liberals,” the Federal government, and the very notion of climate change. And we can see it in the contemptuous, anti-government Congressmen they elect. It’s a mentality that puts white Christian males at the center of things as a sort of aristocracy decreed by a paternalistic, Old Testament God. In this view, there is a divinely ordained moral order, and deviations from that order are why we have problems. Antebellum Southerners demanded to be “free” to own slaves. That is the crux of the mentality: freedom to dominate others. We’re long past slavery, of course. But a deep cultural attitude remains. At first it manifested as the “freedom” to maintain a segregated society. It took decades to overcome and deinstitutionalize that notion. Now, the cry is for the “freedom” to spoil the environment. It’s the “freedom” to conduct business without consumer-protection regulations. It’s the “freedom” from being taxed for the common good. It’s the “freedom” to project our power across the globe without pushback from foreign countries. It’s a peculiar American chauvinism. This is a mentality of aggrieved entitlement, duality, and blame. People who oppose this view are lesser Americans who are causing its problems. If everybody just accepted a social structure that institutionalizes this God-given dominance, then all would be as it should. If you suggest measures that interfere with the above “freedoms,” then you have chosen sides—the wrong side. If (or, I hate to say, when) the ice cap disappears and the jet stream whips the globe like an unattended firehose, agriculture will collapse, followed by the economy. Declining incomes, already worsening by the year, will drive many, many people over the edge. It’ll be like the 2008 crisis on steroids, with sky-high food prices, empty supermarket shelves, unemployment like we haven’t seen since the Great Depression, and a good deal of fear and alarm as the reality of what is happening sinks in. Today’s Congressional impasses will seem trivial. The “freedom” people—the ones who want to be “free” to own large-magazine, fully automatic weapons with no regulation—will angrily oppose the measures needed to cope with this fundamental change in the weather as “tyranny,” just as they opposed Obamacare as tyranny. Only the stakes will be much higher as they realize that change is permanent and will only get worse. Someone will have stolen their future. Congress sometimes resembles itself as it was in the year of the Compromise of 1850, when two irreconcilable worldviews headed toward collision, with one side clearly in the wrong. But then, as now, pointing out that inflammatory fact would have hastened the collision. Maybe I’m wrong. Maybe if the ice cap goes, it’ll inspire the realization that the only way to deal with it is though the unity and cooperation this country showed in World War Two. Maybe there’ll be an outpouring of cooperation in the face of desperation. I wish that cooperation could happen now. Interesting, especially in light of some of us in the climate movement taking an abolitionist approach to fossil fuels. Ending an economy based on slavery seemed overwhelming at the time — everything was so cheap (because of all that free labor)…but it was wrong, Similarly, shifting from fossil fuels seems overwhelmingly difficult, and we have been getting things cheap (although we pay in medical costs and a disrupted climate) ….but it is the moral crisis of our time. And Sandra Steingraber: That’s what attracts me to the human rights approach. The first thing you think about when you consider human rights is resistance. The human rights movement is one long chain of heroic people resisting power. I’m really empowered by abolitionism, for instance. The wild-eyed revolutionaries of that day are the ones we now think of as the reasonable people, the ones who said we had to pursue emancipation no matter how tied our economy was to unpaid labor. It was the only right thing to do. There were all these other people, people we don’t hold in high regard now, who took a regulatory approach to slavery, who were architects of things like the Missouri Compromise. This approach only delays where we really have to go, and, in the case of emancipation, only made the end a more bloody experience than it might have otherwise been. She also discusses this in her book Raising Elijah ….